A safari can be incredibly romantic. Observing wild animals up close in their natural habitat is a thrill, the sunsets are magical and activities can include candlelit dinners for two in the bush, sleeping under the stars and hot air balloon rides at dawn. Another huge advantage of a safari is that all the details are taken care of from the moment you arrive to the minute you depart, leaving you time to unwind and spend quality time with your partner. For this reason, safaris are popular with honeymooners – and are also the perfect setting if you’re planning to pop the question! Here’s what to expect romance-wise in each major safari destination in Africa. The original home of the safari, Kenya has some seriously dreamy places to stay. 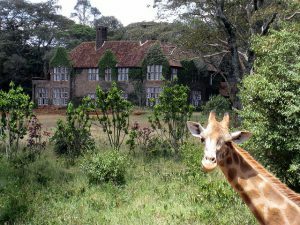 Plan ahead and spend your first night in Nairobi at Giraffe Manor, a fabulous hotel where the resident giraffes poke their heads through the windows and share breakfast with you. 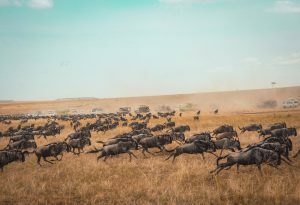 The Maasai Mara has a terrific concentration of game year-round, but you may get to witness the spectacle of the Great Migration – it takes place during honeymoon season! Between July and the end of November up to two million wildebeest, accompanied by zebra and antelope, gather up their young and trek to the Mara from the Serengeti Plains – a magnificent sight, especially at river crossings. Stay at Cottar’s 1920s Camp for the complete ‘Out of Africa’ experience. Located a kilometre from the Maasai Mara, this family-run camp has tents furnished with family heirlooms and antiques and includes butler service, a spa and a swimming pool. Another option is The Sanctuary at Ol Lentille in northern Kenya’s Laikipia Region. With only four villas, privacy and seclusion is assured and there are no early morning wake-ups as you can go out for a game drive when you please in your own private vehicle. Activities on offer include walking safaris, camel safaris and horse-back riding through a private conservation area three times the size of Manhattan – plus you can take advantage of unlimited spa treatments during your stay. Another of our favorites is Ol Donyo Lodge, located between Tsavo East and Amboseli National Parks. Each suite has a private plunge pool and roof terrace with a ‘star bed’ that allows you to sleep out in the open. Like all the lodges we recommend, Ol Donya has a commendable conservation ethos. Another plus for Kenya? If you want to add on a beach break either before or after your safari, the coastline is dotted with pristine white beaches lapped by the warm waters of the Indian Ocean. 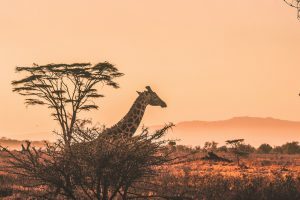 The vast Serengeti plains in northern Tanzania also witness the Great Migration, and the Ngorongoro Crater offers superlative wildlife viewing. You can also trek with chimpanzees in the Mahale Mountains or, if you’re feeling adventurous, climb Africa’s highest mountain, Kilimanjaro. If you’re in the mood to splash out, the recently re-styled Singita Faru Faru Lodge is an intimate and exclusive retreat overlooking the Grumeti River in northern Tanzania – the migration passes by between May and August. There are only eight rooms and the décor is a mix of African and contemporary Danish style. As well as night drives and cultural activities, you can take to the skies for a hot air balloon ride or just stay put and enjoy the infinity pool and spa. Little Chem Chem is set in a 16,000-hectare private concession between Tarangire and Lake Manyara National Parks. While you can choose to go for game drives in either park, you’re equally encouraged to relax in the spa or by the pool, or go on bush walks – or even a run – with a Masaai guard, or spend a morning visiting a local school or learning more about their anti-poaching unit. Birdwatchers in particular will love it here, and with only five tents, privacy is assured. You can add on a beach break on the island of Zanzibar, where untouched coral reefs make the area a world-class destination for snorkelling and diving. For a real splurge visit Mnemba Island, just off the north coast of Zanzibar, which has an on-site PADI dive school and only ten beachfront suites. Botswana is unrivalled when it comes to luxury and exclusivity, with many intimate camps and lodges only accessible by air. 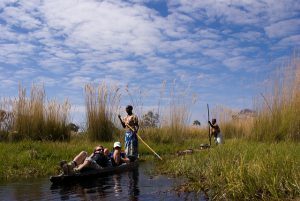 There’s an incredible diversity of game, particularly around the floodplains of the Okavango Delta in the north, and you can take a river cruise or trip on a mokoro (dugout canoe), try a walking safari or even go quad biking or horse-riding. A top choice in Botswana is Zarafa Camp, which has impressive eco-credentials and only four extremely spacious tents, each on a raised deck with a private plunge pool and outdoor shower. Romantic touches include claw-foot copper baths and in-room massages, and the location between the Okavango Delta and Chobe National Park ensures impressive wildlife viewing. Also on the Okovango Delta and bordering Moremi Game Reserve, Qorokwe Camp has just nine suites overlooking a lagoon, so wildlife viewing is rich year-round – particularly when it comes to birds. If you opt for a safari in Botswana there’s also the option of spending a few days at Victoria Falls in neighbouring Zimbabwe. The new Stanley and Livingstone Boutique Hotel has tranquil colonial-style garden suites, and in-suite spa treatments and private dining on your terrace can be arranged. On the Zambian side, we recommend Sindabezi Island, set upstream of the Falls. The property has only five open-sided thatch chalets with river views – and the honeymoon chalet is set on its own sandy beach. 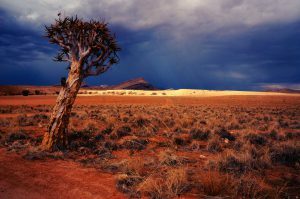 Namibia is an excellent choice if you’ve already been on a ‘classic’ safari – here, it’s as much about epic scenery as it is game, from the immense red sand dunes at Sossusvlei, the glittering white salt pans of Etosha National Park and the isolated Skeleton Coast, which is littered with thousands of shipwrecks and the bones of long-dead whales. Which is not to say there isn’t game – Etosha National Park, which is the size of Switzerland, boasts lion, leopard and elephant, as well as the largest population of cheetah and free-roaming black rhino in the world. You needn’t sacrifice on luxury either. New properties that have opened in the last year include the remote Serra Cafema camp on Kunene River, which has just eight chalets, and the surreal wooden cabins of Shipwreck Lodge on the Skeleton Coast. When it comes to ultra-romantic and luxurious properties, South Africa can’t be beat – and you can add on a beach break in Mozambique, or visit Cape Town for culture and world-class food and wine while you’re at it. Lion Sands Ivory Lodge in Kruger National Park is a honeymooner’s dream, with just six suites boasting private decks and plunge pools, and a special treehouse suite where you can sleep on a platform underneath the stars. Set in a private concession, Singita Lemombo is a contemporary take on a safari lodge, with stylish, glass-fronted suites designed to make the most of the views and plenty of activities besides game drives, such as wine tasting and spa treatments. The food is exceptionally good, and there’s a roof terrace for private dining.